Haunted Hollows was a first for the Tourers in 2014, and it was really one of those hidden gems that we're sorry we didn't get to before! As with many haunts, Haunted Hollows had been on our list for some time, and we never got around to seeing it. 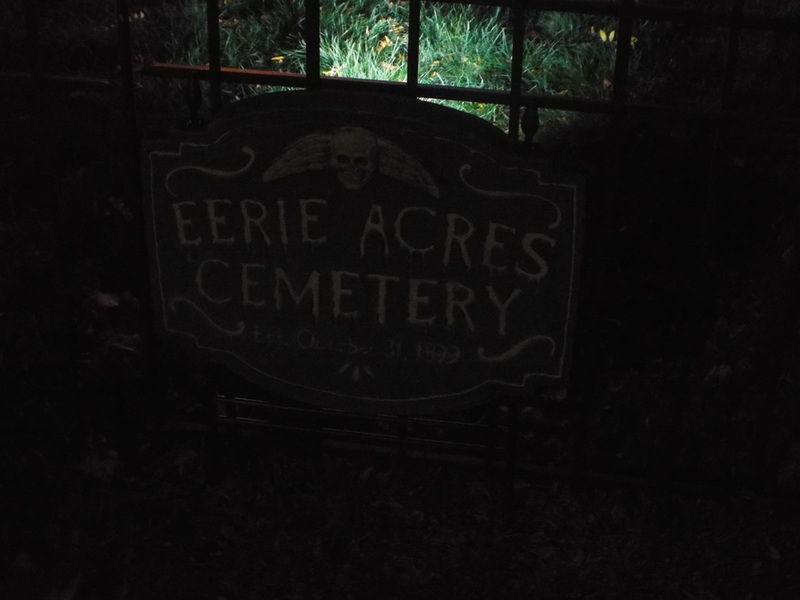 Now after having seen it, it is definitely a "must do" for future haunt tours. 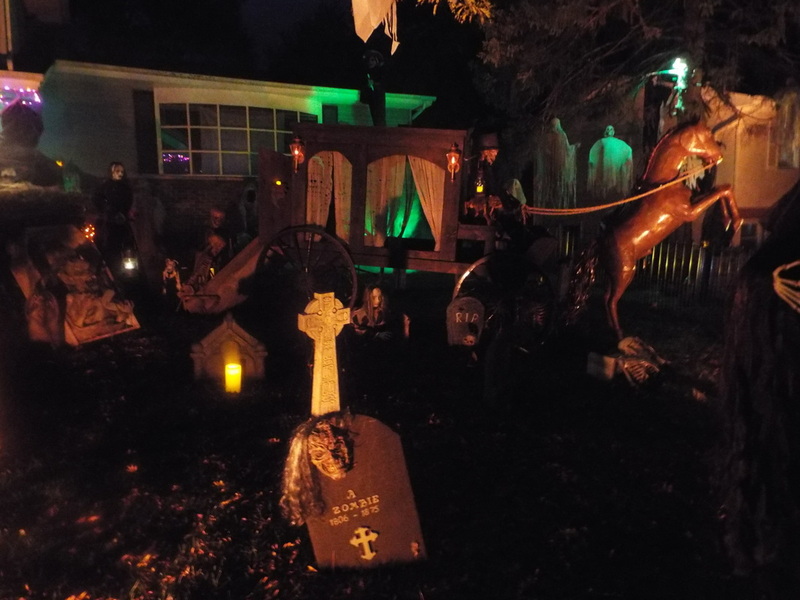 This elaborate yard display has a little bit of everything, all spread out over a large front yard area, with some of it spilling onto neighboring yards as well. 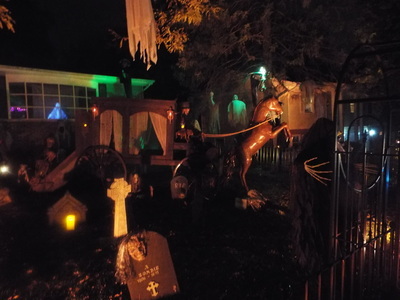 The various scenes are dominated by a full size carriage and horse. While we've seen carriages and horses before, the difference here is that the horse is made of metal, almost like a bronze statue. 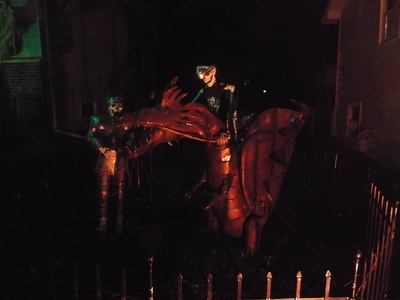 It is also rearing back on its hind legs and strikes and eerie pose that sets the tone for the entire display. 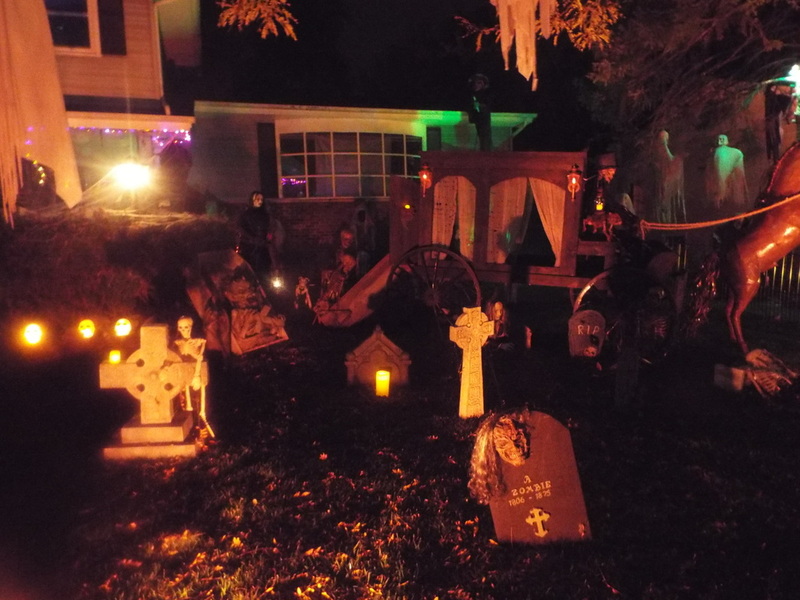 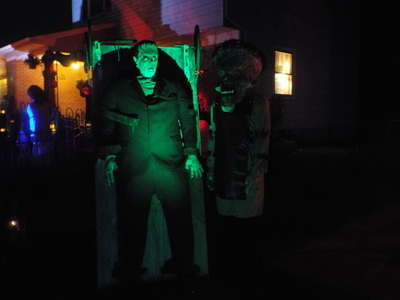 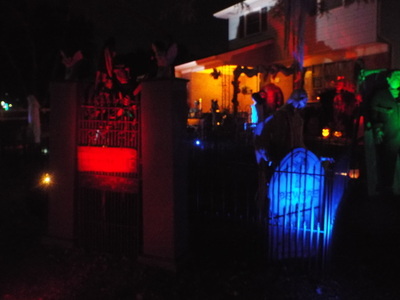 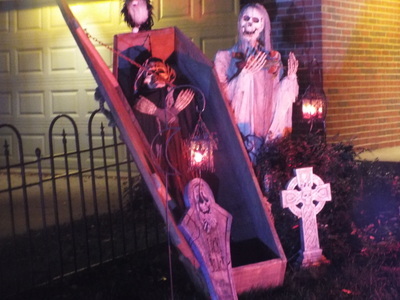 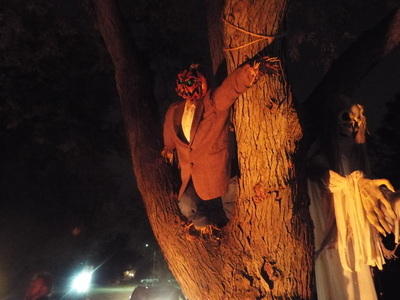 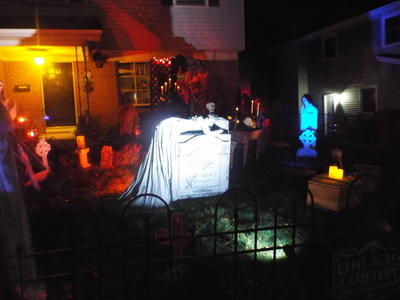 Around the front yard are various scenes, including a glowing skeletal figure peering out from the crucifix cut out of the front lid of a coffin, a winged figure of the Grim Reaper standing at a set of cemetery gates, Frankenstein's monster on his slab, a ghostly old-fashioned bride figure whose large eyes seem to stare right through you, and a weeping woman draped over her beloved's tombstone. Each scene is accompanied by some effective and moody lighting, which illuminates the figures just enough to make them scary but not too much as to dilute their effectiveness. 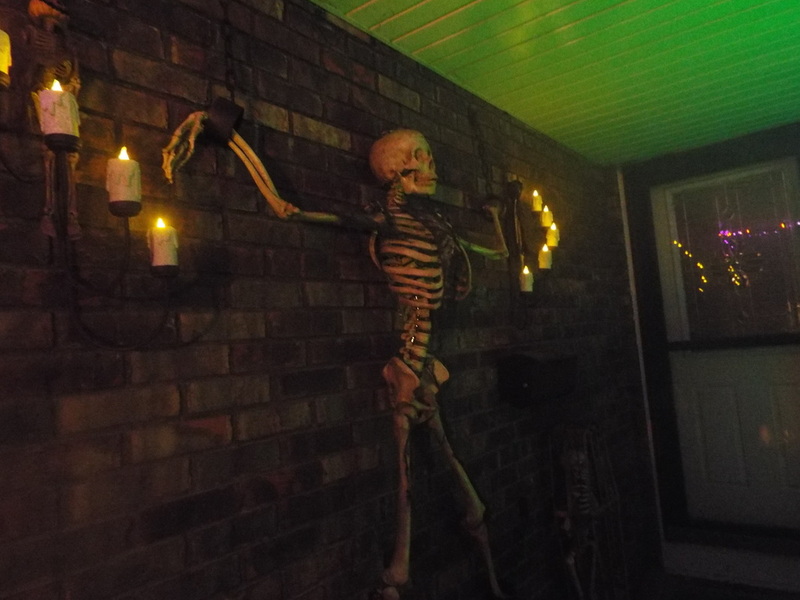 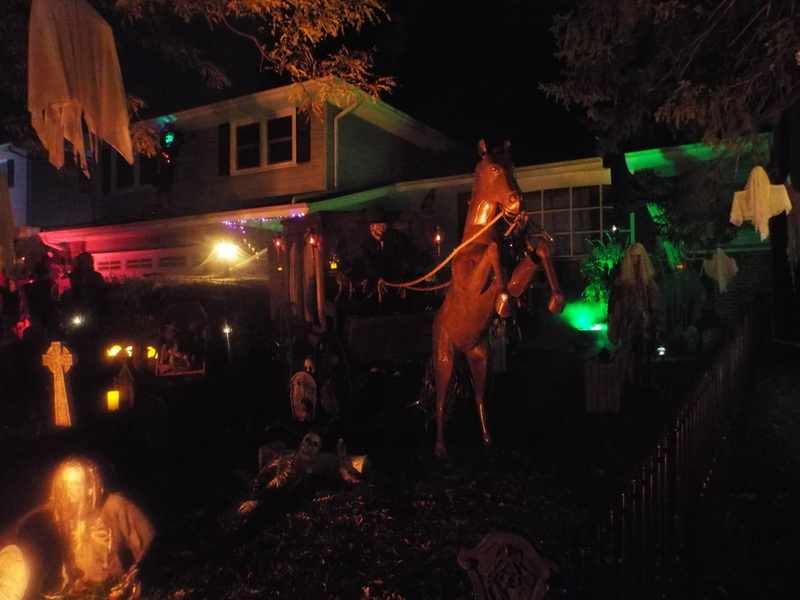 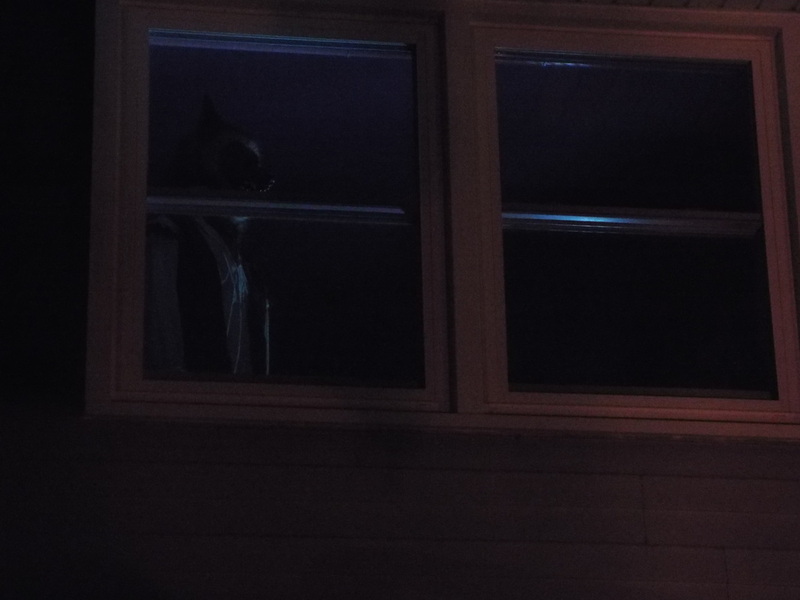 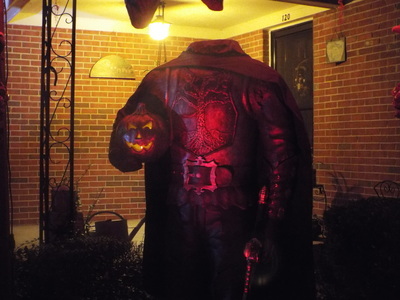 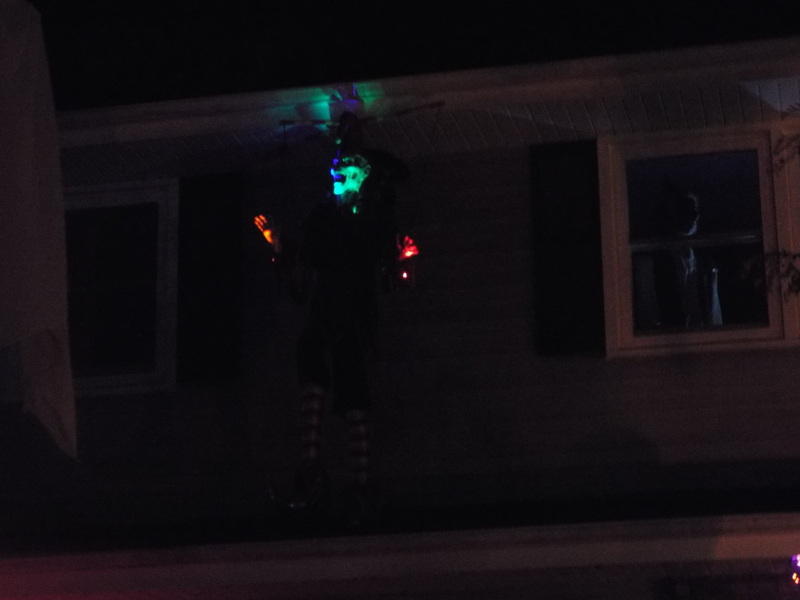 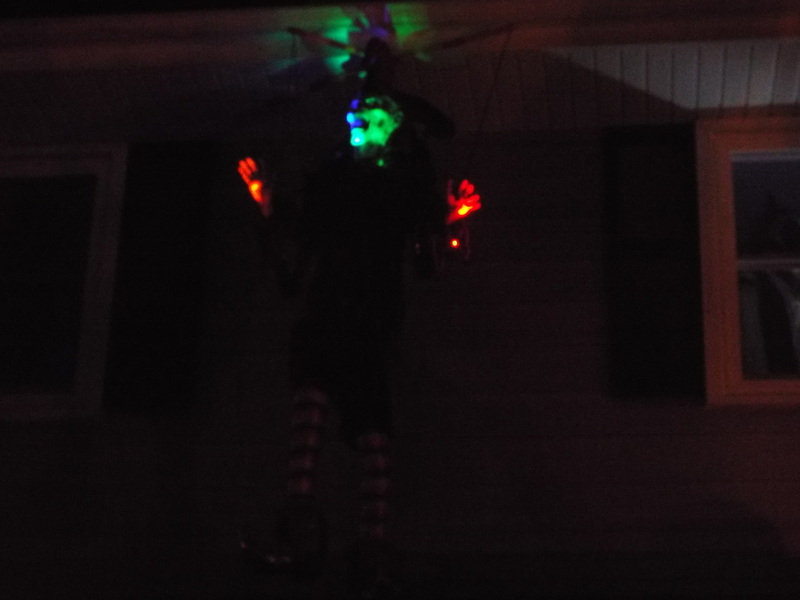 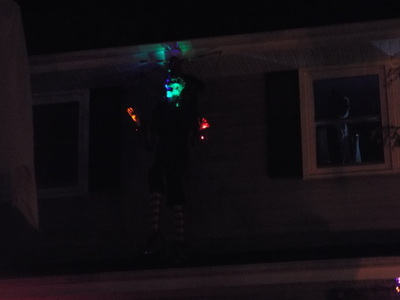 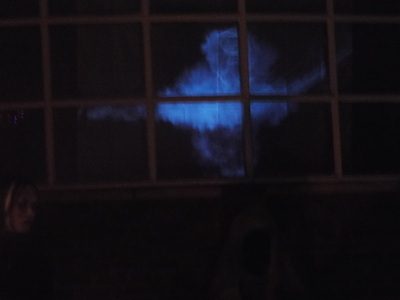 And in addition to the scenes above, there was a nice life size Headless Horseman, complete with jack-o-lantern head held in his hand, a series of skeletal pirates, and even some animated ghostly projections coming from the front window of the house. 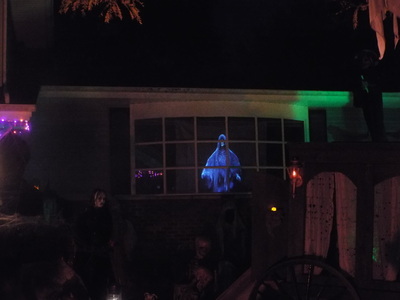 They were situated in such as way as to be visible out of the corner of your eye as you were viewing the items in the yard, giving you that momentary feeling of being watched. 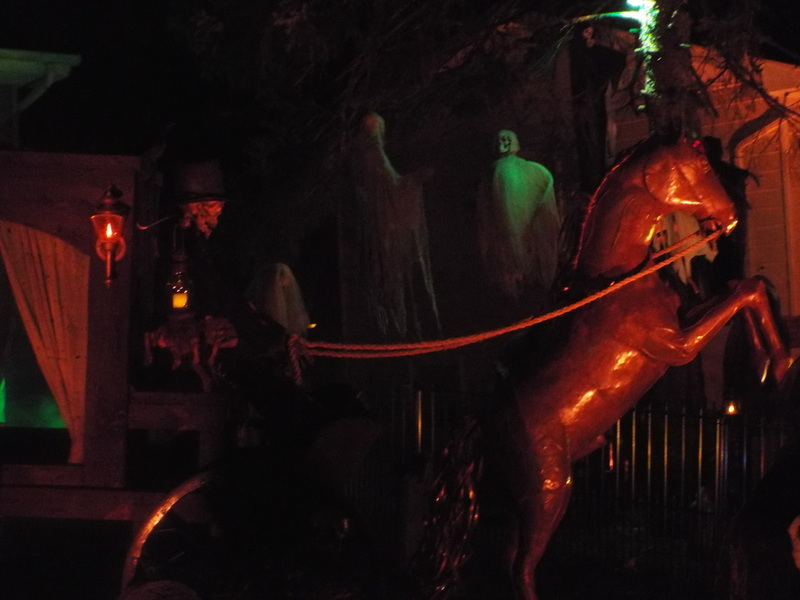 One of the most interesting things in the display, aside from the metal horse ( which I seem to recall was hand-crafted, unless I am mistaken on that), was something not usually seen in haunted displays. 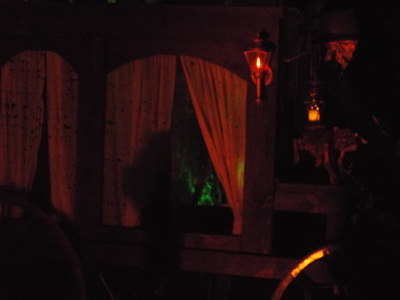 In fact, we can only recall one other time where we've seen something similar. 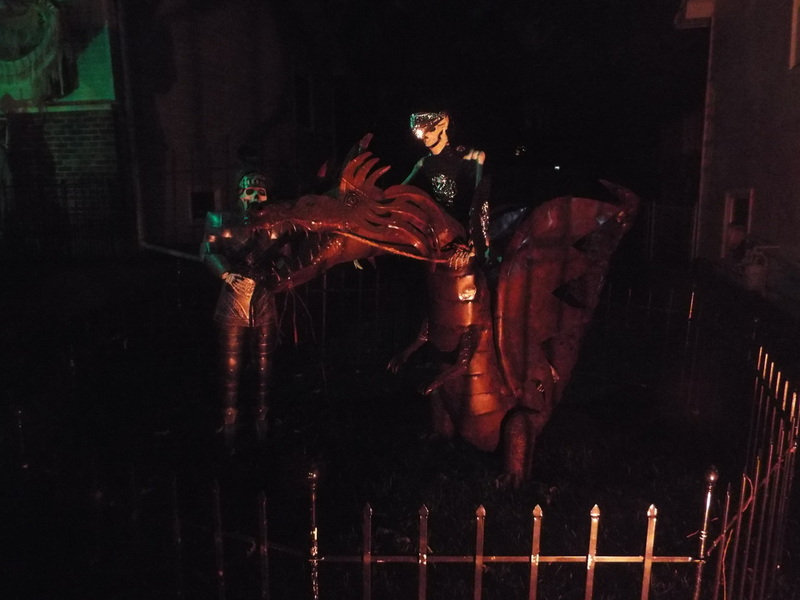 In one section, Haunted Hollows had some skeletal knights in armor as well as a large metal dragon, similar in styling to the metal horse. Not only is the knights in armor theme a rare one to see, seeing a large metal dragon was really unusually to say the least! 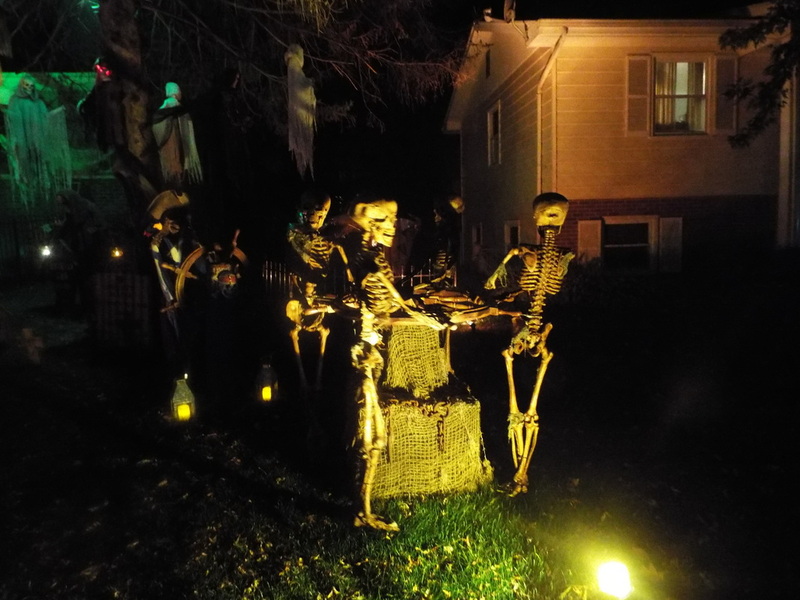 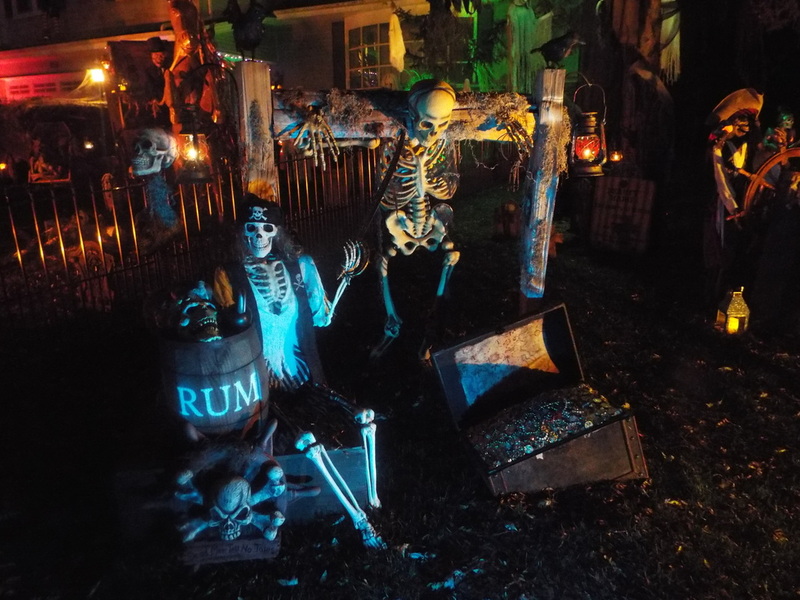 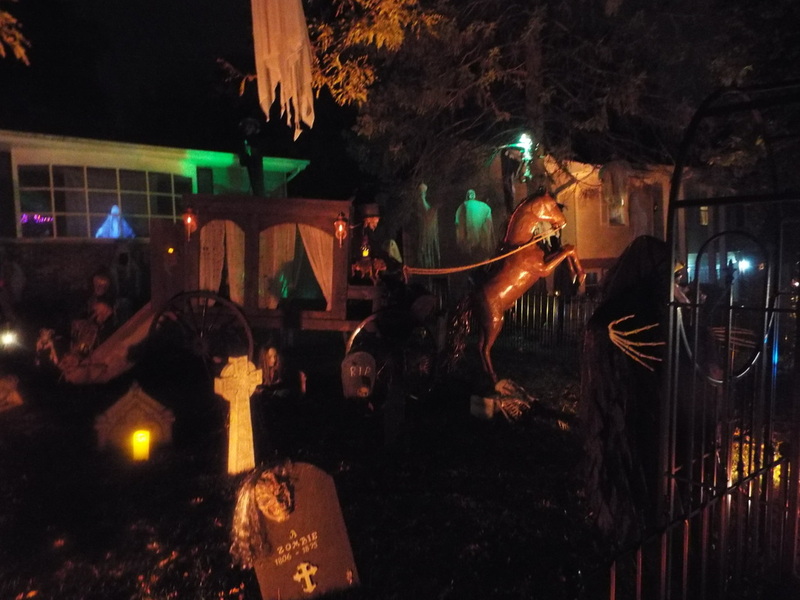 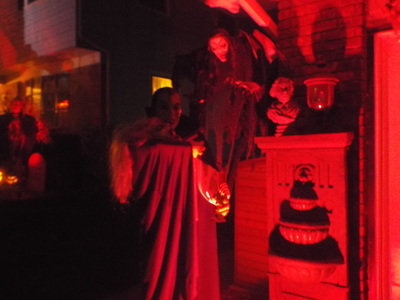 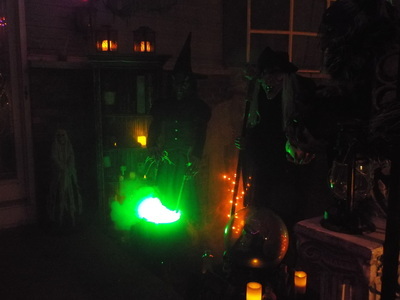 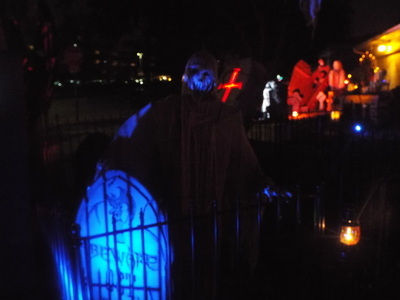 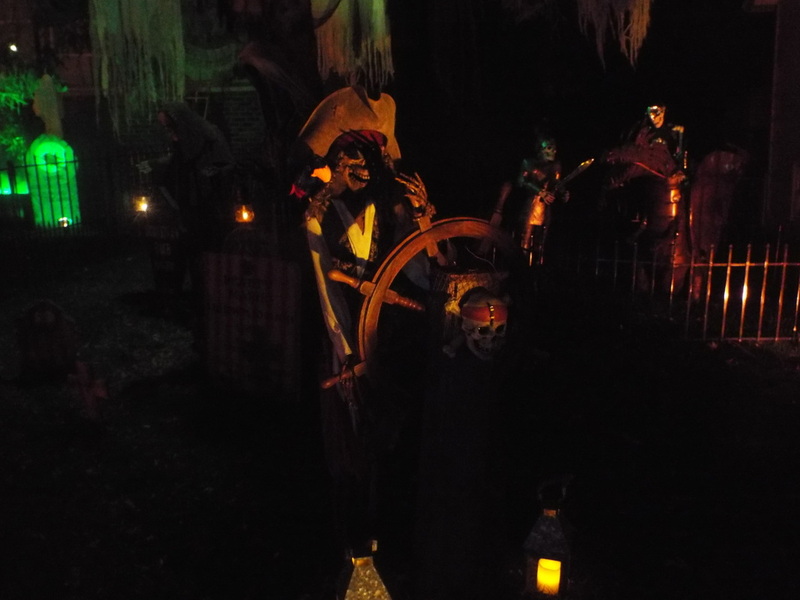 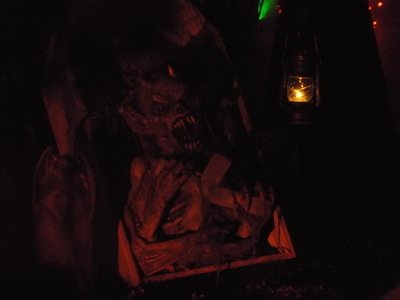 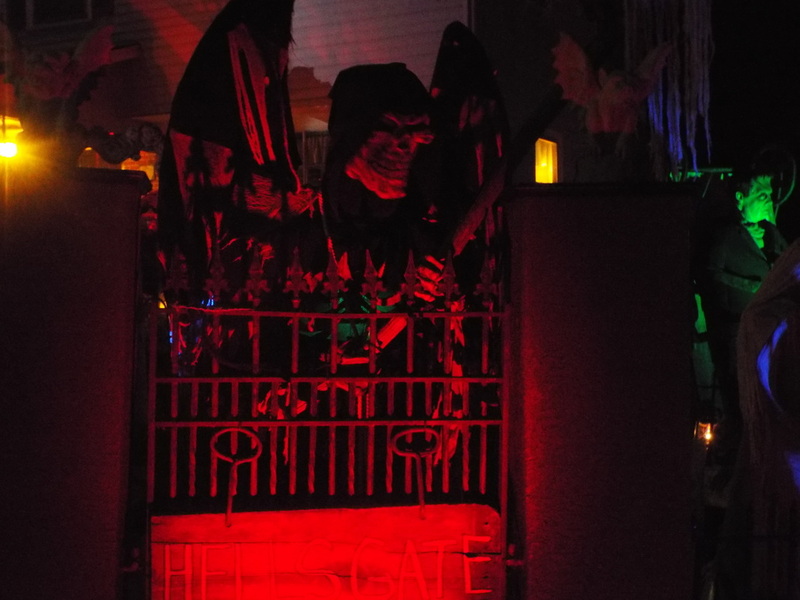 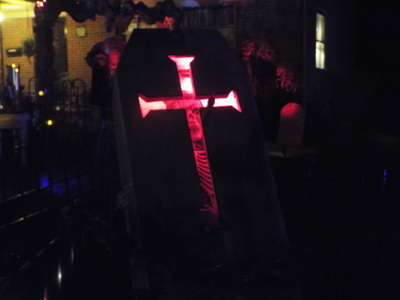 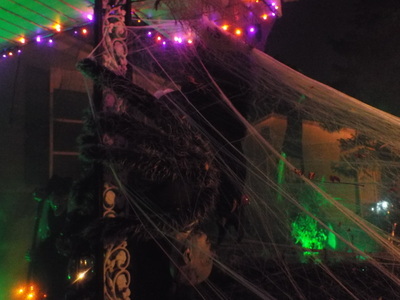 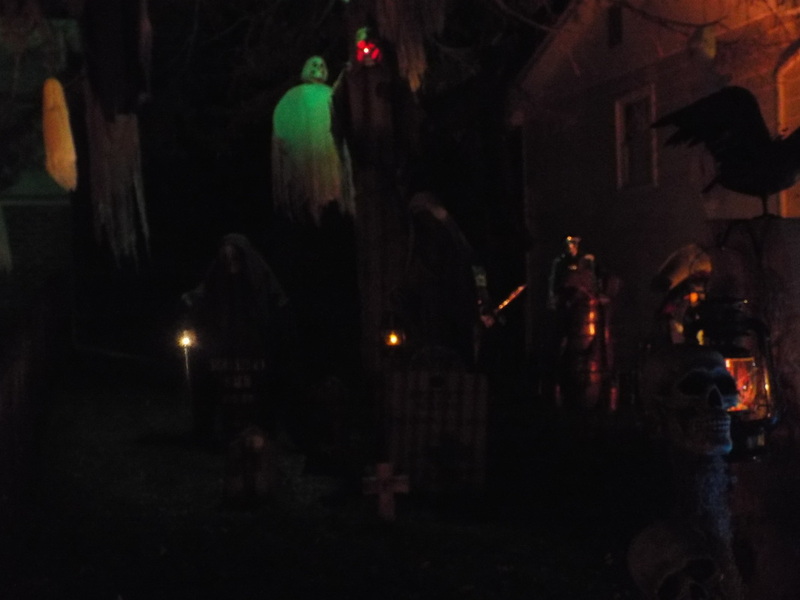 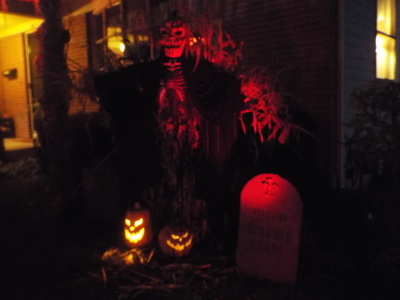 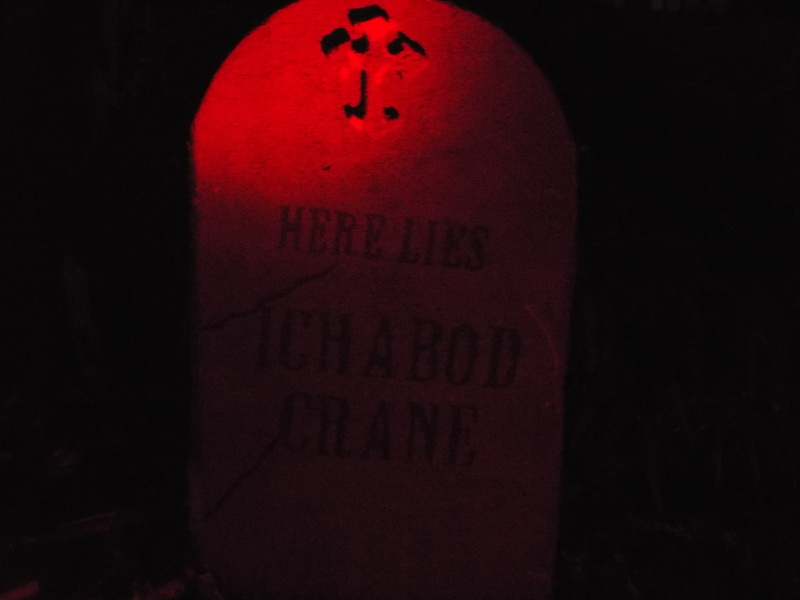 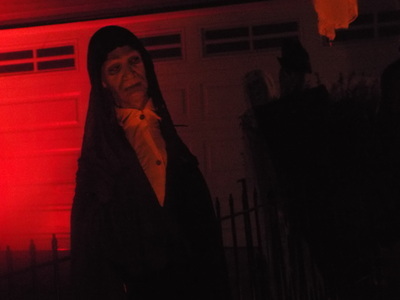 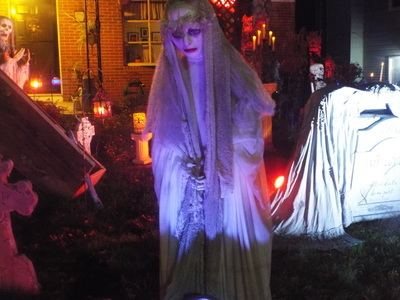 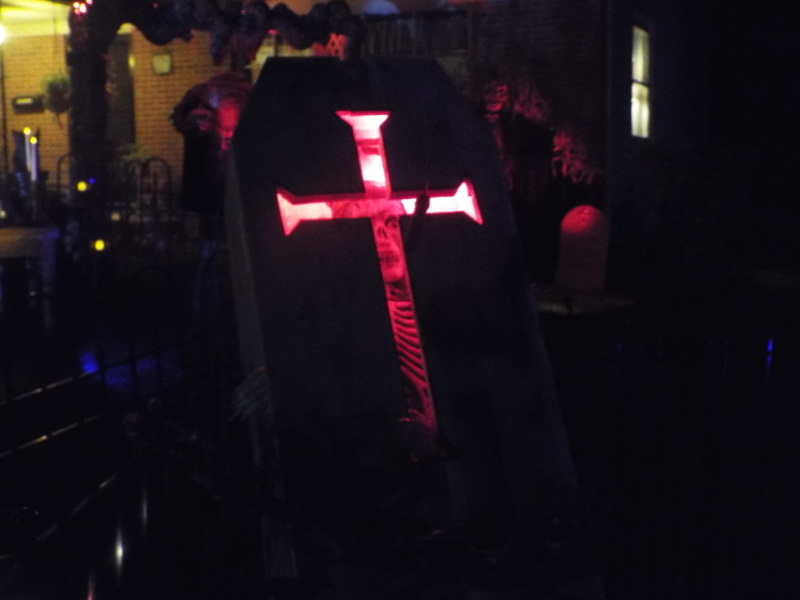 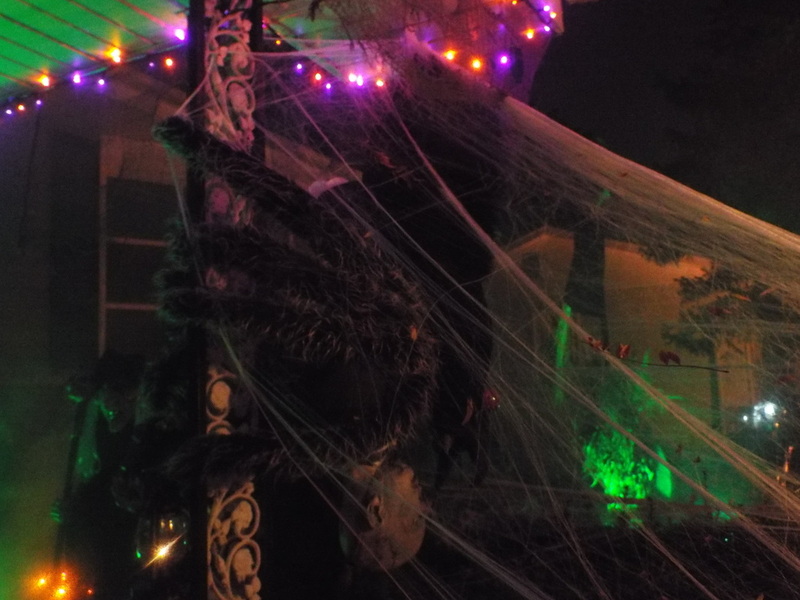 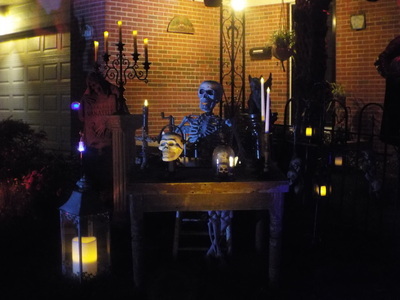 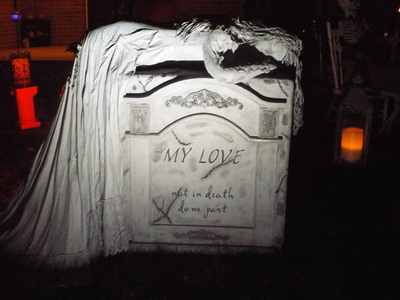 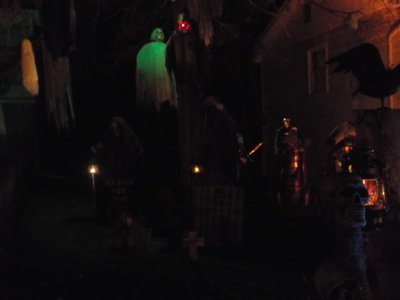 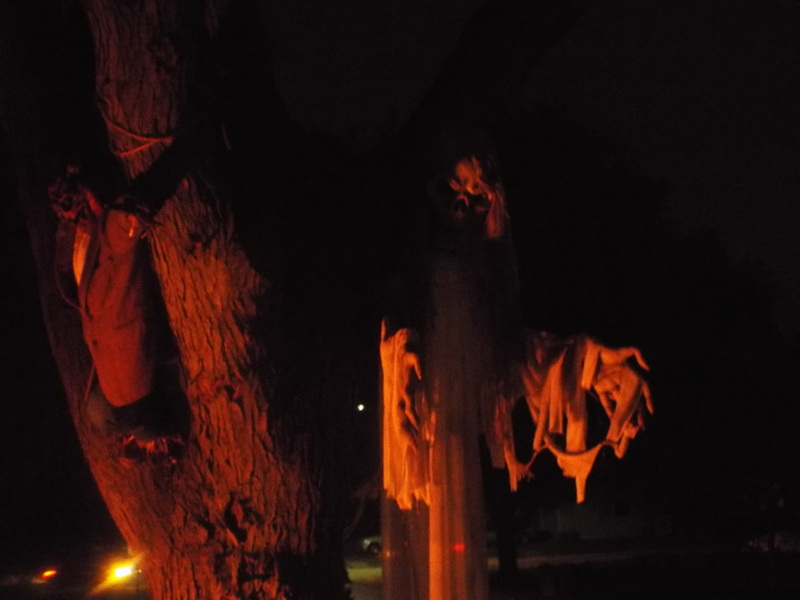 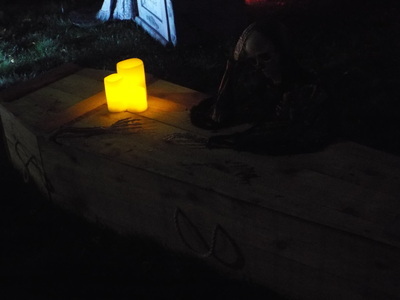 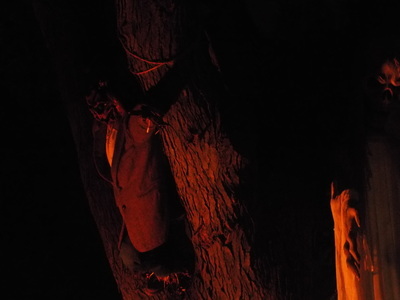 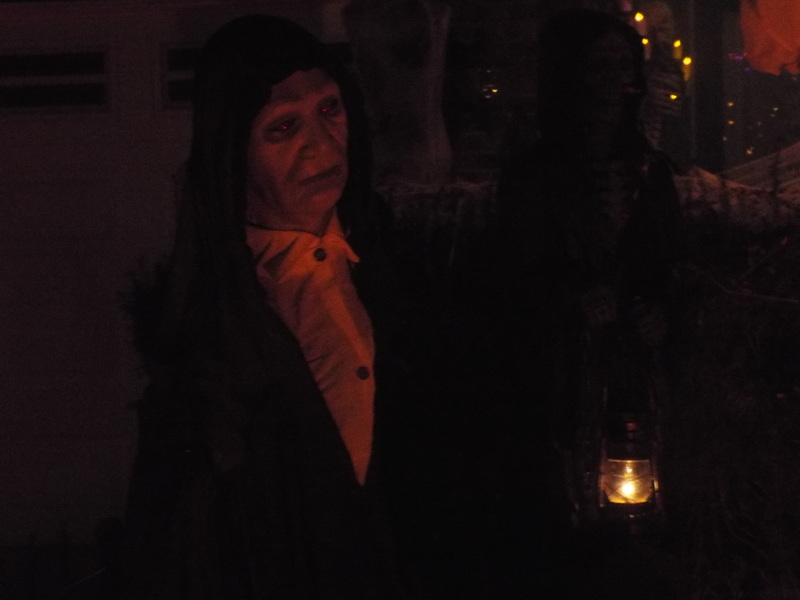 It was another clever little touch that sets Haunted Hollows apart from other yard displays. 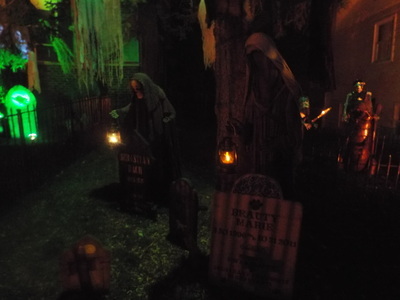 In short, we're sorry we missed Haunted Hollows in the past, but we will make sure to see it in the future! 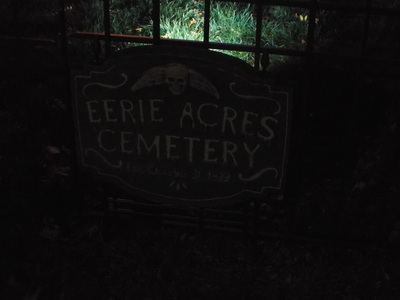 It's well worth the trip, and it has something for the entire family. The display is large, varied, and has some great lighting. 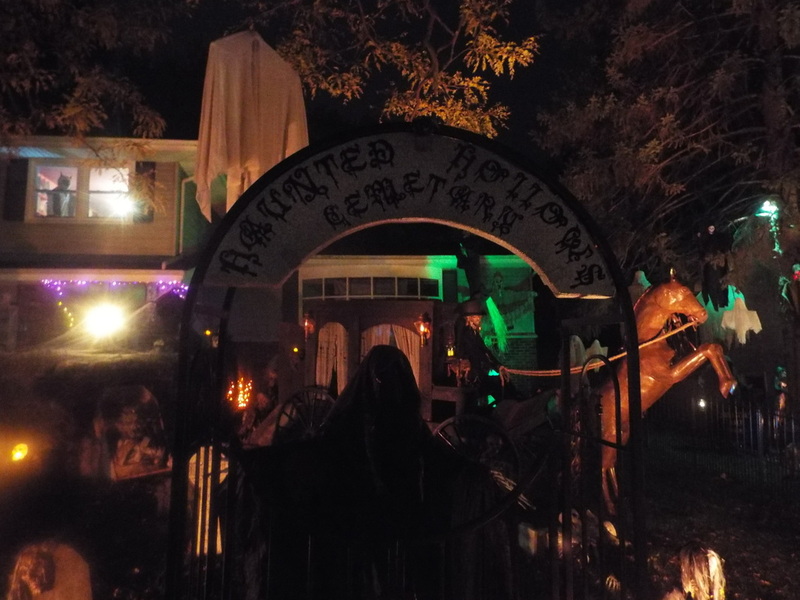 The enthusiasm of the owners really shines through, and it's one of our favorite haunts of 2014!